Last year I came across a blog that discussed the concept of selecting a word as your theme for the coming year. I loved the idea and decided to embrace it – my word for 2012 was give. I realized how blessed I was (and at that time I couldn’t even imagine the blessing-to-come in our daughter) and wanted to share that with others, both in resources and in time. It’s also vitally important to my husband and I that we teach our children to be givers as a natural instinct (something that can feel impossible with a 3- & 5-year-old). I’ve certainly still got room for improvement in that arena, and giving will be something I strive to continue, but I felt like it was a fitting word for the year. An unexpected lesson learned was to also be a gracious receiver. Sometimes I can be so enthusiastic to give that I might inadvertently rob someone else of the joy of giving, and I learned that receiving things wholeheartedly and joyfully can be a gift to others, too. It’s very easy for me – with family commitments, work commitments, and blogging commitments, among other things – to fall into autopilot mode. I rush through the morning to get us out the door on time. I mindlessly snack on things, sometimes without really even being hungry. In spare time, it’s quickly sucked away by aimlessly surfing Facebook or Pinterest. With regard to budget, it’s all-too-easy to fall off track and make impulse purchases that are, frankly, idiotic for our long-term goals. So, I want to live with purpose this year. I want to keep my faith at my forefront. I want to think about what I say to those that mean most to me – especially my husband and kids – and make sure words are uplifting and encouraging. I want to think about what I say to those I don’t know, remembering that my interaction with them could very well make a difference in their day. I want to be purposeful in what I eat and make healthier choices. I want to really think about items we purchase and decide if they’re worthwhile. I want us to spend our money in a way that benefits others that need it more than we do. I want to be a more purposeful blogger, and write posts that really reflect what I think and what is going on with my life. I want to tackle a project I’m really excited about and act with purpose to follow through on bringing it to fruition. My hope is that keeping purpose as my theme for this year will cause it to trickle down through every aspect of my life, so that I can live more fully, be there for others more often, love more deeply, be a better example of Christ, and become a better person as a result. I almost finished this post with the sentence above, but realized that I ought to decide on a few specific actions to start implementing purpose from the start, since January 1 is looming. Go to bed earlier. I tend to stay up too late, making me tired and less effective. This will mean making better use of my time in the evenings, too. Get up earlier in the morning – early enough to allow time for a decent devotional and a brief workout, and to really focus on each of the kids without just rushing out the door. I want the start to their day to send them out the door feeling loved, valuable, and happy. Perform one purposeful, conscious act of kindness each day, whether big or small. Make, and stick to, a budget. Set a couple of goals for things to save toward for motivation. Set aside money specifically for giving, and let the kids help us think of creative ways to use that money to help others. Make a monthly meal plan and be better about shopping sales again to save money. Have a variety of meals (no more food ruts!) 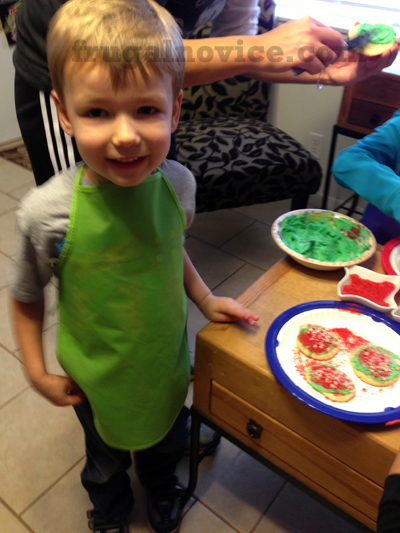 and incorporate plenty of veggies & fruits, even if I have to sneak them in for our five-year-old. What is your word for 2013? 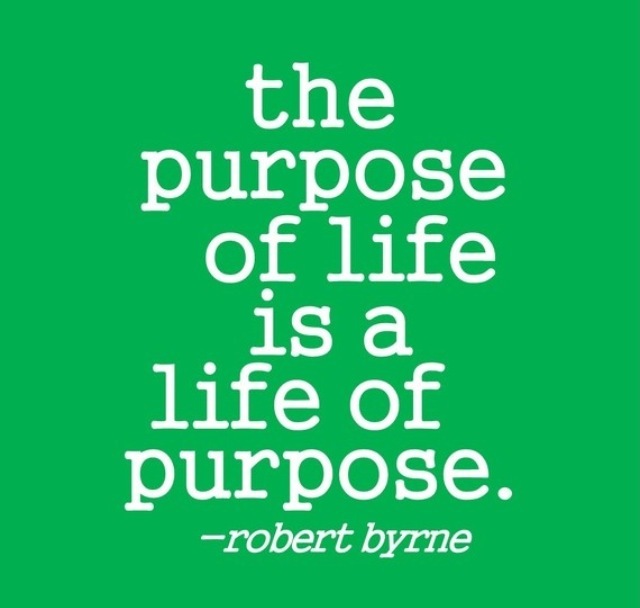 And do you have any advice for me on really committing to purpose? Whatever your word, or your goals, or your hopes and dreams for 2013 are, I hope it’s a year of blessings and growth for you. For safety and happiness, for joy, and for memories made with those you love. Do you like to celebrate the little things in life? A lost tooth, an A+ on a test, or finding your keys you were just certain were lost? 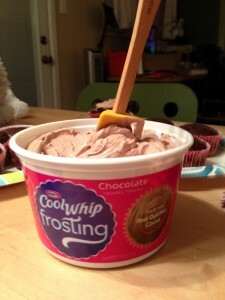 Well, with Cool Whip frosting you can have items on hand at all time to celebrate any occasion. 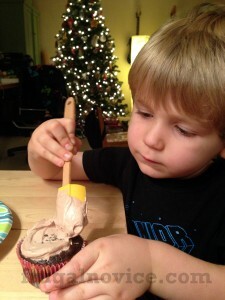 This frosting will have you looking for any reason to frost a cake or cupcake and celebrate! Found in the freezer aisle, Cool Whip frosting is whipped to perfection, making it easy to spread while providing a perfectly sweet touch to your baked goodies. As a great alternative to canned frosting, Cool Whip frosting comes in three flavors: Chocolate, Vanilla and Cream Cheese. We bought all three to try out and I’m keeping the vanilla and cream cheese to have on hand, but we decided to celebrate Christmas Eve Eve (the 23rd, of course) with some fun cupcakes. 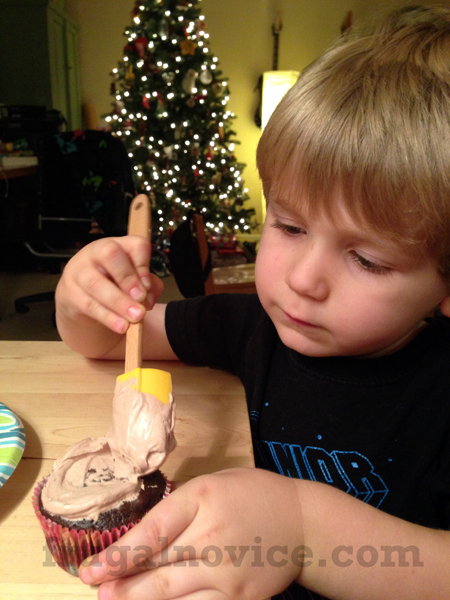 The frosting is easy to spread and tastes great! We loved adding it to our cupcakes and having a special treat. One winner will receive the prize pack detailed above – valued at $100 and filled with fun items to help you celebrate any occasion! This contest is open to all U.S. residents aged 18+. Entries will be accepted until the end of the day (midnight Central) Wednesday, January 9. By entering this giveaway you agree to the Official Rules. Note: I received a prize pack for writing this post, and one is being provided for the giveaway. I was not compensated monetarily. All opinions are honest and are my own. If you’re like us, the start of the new year is always a little bit of being in recovery mode from all the abnormal spending of the holidays. With that in mind, Johnson & Johnson Family of Consumer Companies will release its Healthy Essentials coupon book on Sunday, January 6th, in local newspapers everywhere and online at www.healthyessentials.com. This great coupon book will include over $175 in savings! NEUTROGENA® Ultra Gentle Daily Cleanser ($7.99-$8.99): This effective yet gentle cleanser removes excess oil, dirt and even makeup while protecting skin’s natural moisture barrier to leave it feeling soft, never too dry, and never too tight. Ideal for both of you to use through the winter months! NEUTROGENA® Oil-Free Facial Moisture SPF 15 ($11.99): This lightweight, non-greasy formula will become a household staple. Enhanced with broad spectrum coverage that protects skin from damaging UVA/UVB rays, so your skin is hydrated (and protected!) indoors and out. RoC® RETINOL CORREXION® MAX Wrinkle Resurfacing System ($26.99):You’re not only young at heart! A simple system that achieves MAXIMUM anti-aging results with two steps that combine RoC® Retinol and a Resurfacing Serum with E-PULSE® Technology. LISTERINE® Antiseptic ($3.89): LISTERINE Antiseptic is the only nationally branded, over-the-counter mouthwash that carries the American Dental Association’s (ADA) Seal of Acceptance for effectiveness and gingivitis. Just 30 seconds a day is all it takes to provide 24-hour protection against germs! 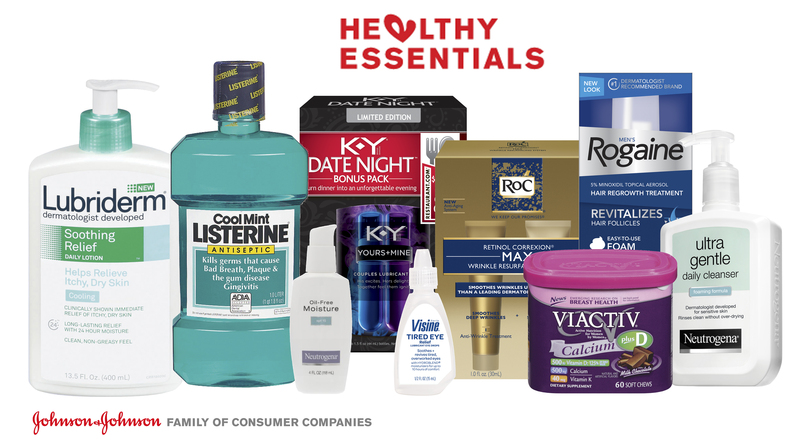 K-Y® DATE NIGHT™ ($24.99): For a night without the kids, these packs pair great intimacy enhancement products with a $25 Restaurant.com gift card toward a meal for two. Bon Apetit! LUBRIDERM® Soothing Relief Daily Lotion ($7.99-$8.99): Cooling menthol immediately relieves itchy, dry skin while providing long-lasting relief with 24-hour moisture. A staple you’ll both be counting on in the harsh winter months! VISINE® Tired Eye Relief ($7.99): Your tired, overworked eyes will appreciate these eye drops’ with unique HYDROBLEND® formula. Acting like natural tears, they relieve burning, irritation and dryness for up to 10 hours of comfort. Men’s ROGAINE® Unscented Foam ($49.99): Help stop hair loss with Men’s ROGAINE® Foam – the FIRST easy-to-use foam FDA-approved to regrow hair. In clinical testing, it regrew hair in 85% of men who used it twice daily. VIACTIV® Calcium Chews ($8.49-$11.49): Help build strong bones for a stronger you tomorrow! Viactiv® contains three bone-building nutrients – Vitamin D, Calcium & Vitamin K. The soft chocolate chew makes it ideal for mom and dad on the go. One winner will receive the prize pack detailed above – again, valued at $155 and filled with GREAT healthy essentials products from the Johnson & Johnson family! This contest is open to all U.S. residents aged 18+. Entries will be accepted until the end of the day (midnight Central) Friday, January 4. By entering this giveaway you agree to the Official Rules. Note: The prize is being provided and I am receiving the same prize. I was not compensated monetarily for this post. All opinions are honest and my own. Before we know it (it’s less than a week away now!! ), the holidays will be upon us. One thing you want to be sure of this season is that you don’t forget the batteries for those electronic holiday gifts. With Energizer MAX batteries with Power Seal Technology you can have the confidence in knowing you will have power when you need it most throughout the holidays and beyond. These new batteries hold their power for up to 10 years on shelf! 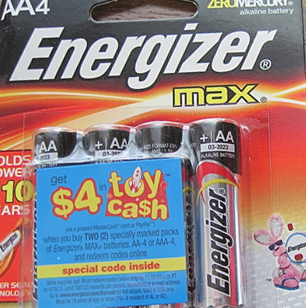 What’s awesome is that when you purchase specially marked packages of Energizer MAX batteries with Power Seal Technology, you can get up to $8 in Toy Cash (via prepaid MasterCard or PayPal). I love this – I mean, it’s an easy way to basically get money back for your purchase! You know what’s even MORE awesome? A giveaway! One winner will receive two packs of specially-marked Energizer Power Seal batteries (AA or AAA)! This way you’ll not only get awesome batteries that can last 10 years on the shelf, but you’ll also get codes to earn Toy Cash! Note: I received batteries from Energizer, and they are providing the giveaway. I was not compensated monetarily for this post. All opinions are honest and are my own. It’s been several days now and my mind is still trying to process how someone could be so monstrous – so diseased – as to carry out the heinous act at Sandy Hook Elementary on Friday. I, like many parents, find it difficult not to worry about our own children, not to imagine that horrible “what if.” We love these little people more than we ever thought possible. Parents know from the start that it’s our responsibility to protect our kids as they grow into not-so-little people, and the idea that sometimes we just simply can’t is heartbreaking. We pray for our kids to outlive us by decades, as they should. I’ve seen many posts on how to talk to children about the tragedy. Some have let their kids watch the news, some have provided a pared-down account of what happened. We’ve decided not to tell our kids what occurred. They’re 3 & 5, and their biggest fear is Swiper the Fox from Dora the Explorer somehow figuring out how to sneak his way into our house. I want them to hang on to that sense of innocence as long as possible. I want their biggest worry to be an imaginary creature from a cartoon, or if their brother is sharing enough of the Legos. But I do think this – kids need to know there are bad people out there. For their protection, so that they know to watch out for them. But also for their empowerment, so that they know it’s up to us – and them – to be good in the world. We can’t take away the horrible, the tragic, the ugly, the hatred. But we can be – and can teach our kids to be – the good, the uplifting, the beautiful. The love. 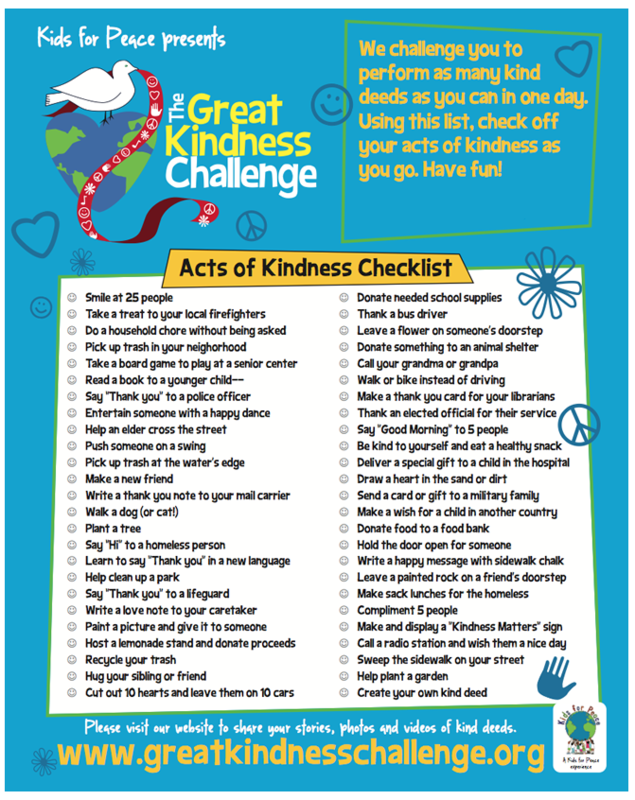 In August of every year the great kindness challenge takes place. I’d suggest we take that beyond one day and help our kids do something purposefully kind every single day, whether big or small. We can teach them the importance of doing good for others, and the value of being lights in a world with darkness. 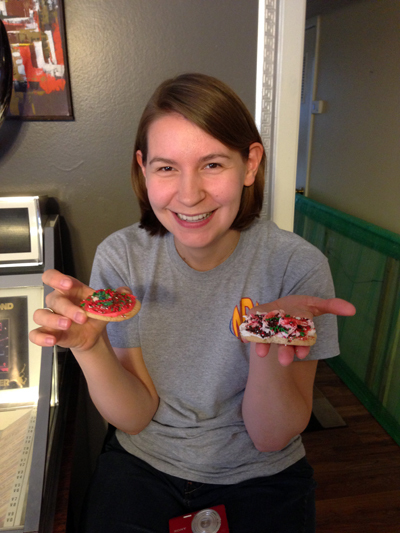 Our kids LOVE to bake and decorate Christmas cookies, so I was really excited to share the fun of this tradition with some good friends this past weekend. One of my friends, Jennifer, and I went to WalMart the weekend before to shop for supplies, and I really realized how far my money could go since I was buying Great Value products and saving money on each of them. My sweet friend Kristi offered to host the party at her house, which was great since her kitchen is a lot wider and more open than ours is. 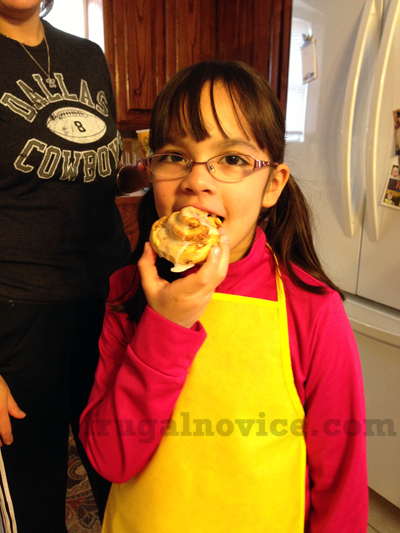 We baked some Great Value cinnamon rolls, which were a great snack to enjoy. I don’t know about you, but cinnamon rolls are a big tradition for Christmas morning. 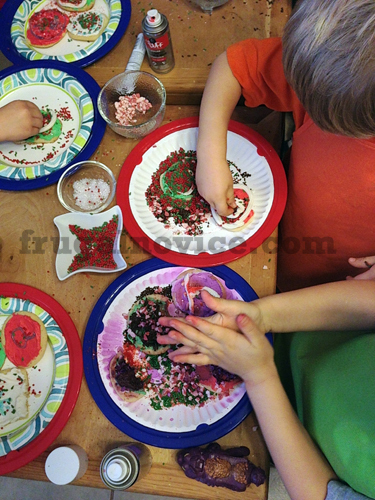 I love the idea of making them from scratch (and have before) but we all know there’s a lot to be done Christmas morning, and it’s more important to spend time with your loved ones than to be in the kitchen. 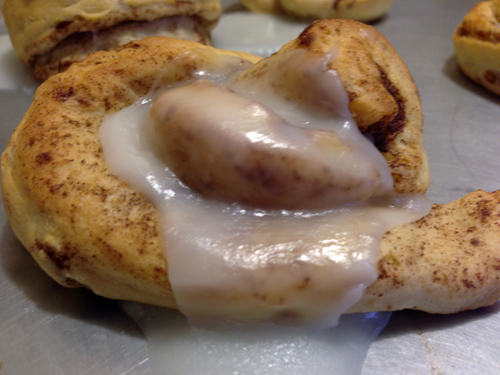 Great Value cinnamon rolls provide an easy, inexpensive, tasty alternative. Then we got down to the fun! 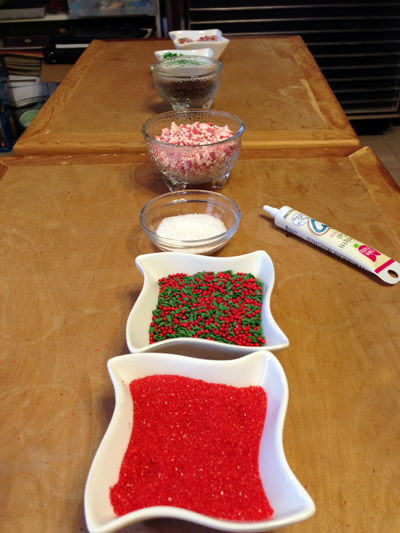 We set up tons of toppings on the station Kristi put together, and Jennifer and I whipped up red & green buttercream icing to go along with the white (again – using Great Value products allowed me to make a TON of icing at a very reasonable cost)! 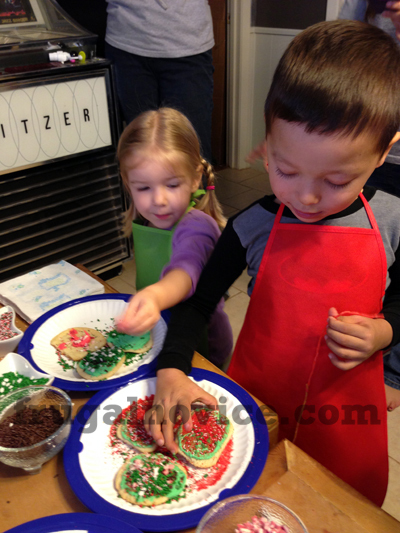 They had a blast with the cookies. Since Great Value cookie dough is so affordable, I was able to buy a lot and provide plenty of canvases for our little cookie artists. 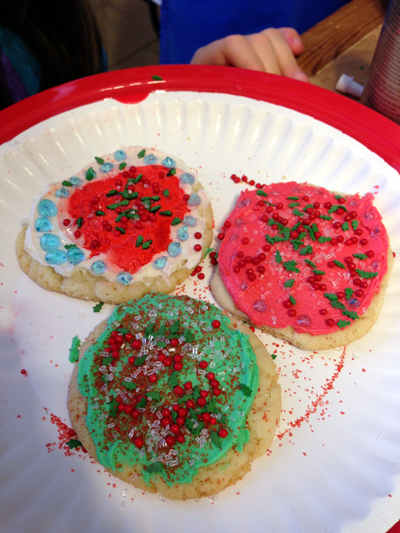 And here are some of the masterpieces (the moms got gifted cookies in abundance, too)! 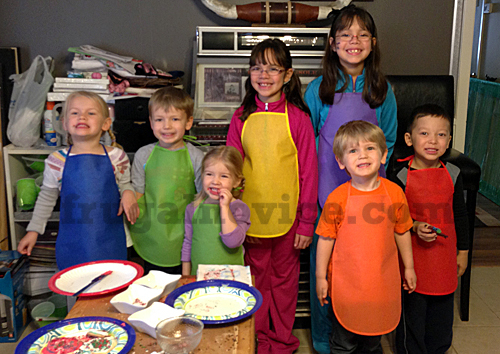 I got the kids colored aprons to wear and take home as party favors, and they humored the moms for a photo in them – aren’t they adorable? If you’re looking for some time to fit in a little more holiday fun, let Great Value cookie dough and cinnamon rolls become a part of your traditions. 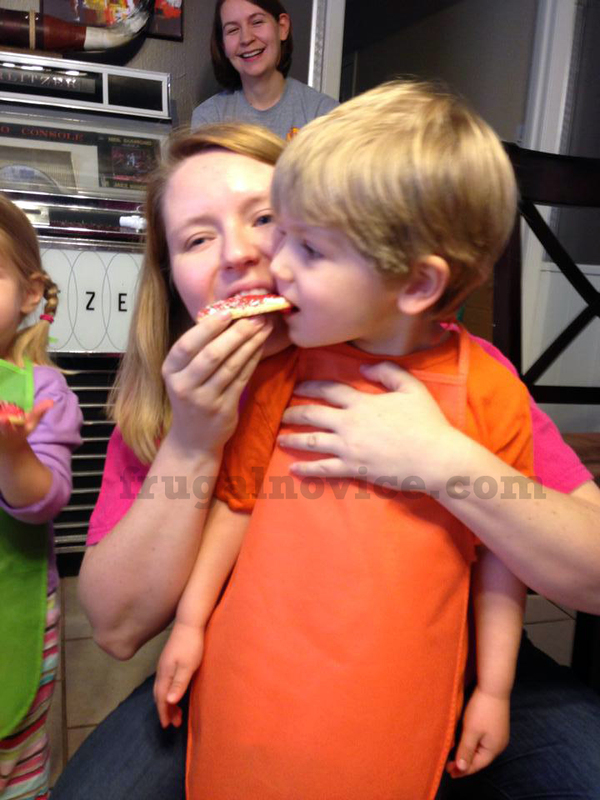 You’ll save money & time, and get quality, great-tasting items to share with your family. Now, if you remember in my previous post, I promised another cookie recipe along with five of my favorite cookies… here goes! 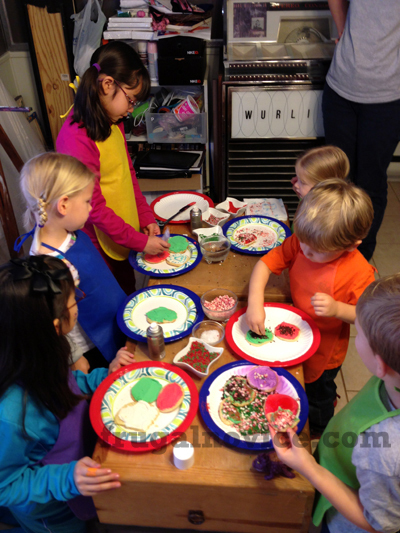 Perfect for the holidays… and SOOOO easy! Open the tube of cookie dough and place into a large bowl. Let it sit out for 15 minutes or so, enough to soften and make it easier to add mix-ins. Add in the zest and orange extract, mixing well. Then add in the cranberries, making sure they’re evenly dispersed through the cookie dough. Roll the cookies into walnut-sized balls and sprinkle with decorative sugar. This is a larger size of sugar than granulated sugar, and it provides a nice sparkle and crunch to the cookie! Bake at 350 degrees for 10-12 minutes, or until golden brown. Note: I am participating in the Great Value program with The Motherhood. I have been compensated for my time. All thoughts and opinions are honest and are my own. I love the Boys & Girls Club of America (BGCA) and the services it provides for the community. They provide a safe place for kids who might otherwise be at home by themselves while their parents are working, and give them one-on-one attention they might not otherwise receive. I got the opportunity to volunteer with the Boys & Girls Club while in college, and it is so rewarding to see how those involved with the program can really have an impact on children. Talk about giving. Tell your kids which causes you’re supporting this year and why. Better yet, make the choice together. Or give each child a portion of what you plan to donate this year and allow him or her to choose the charity. Read books about giving. Try The Mitten Tree by Candace Christiansen, I Can Make a Difference by Julie and Amanda Sexson or a selection from Learning to Give’s Annotated Bibliography of Children’s Literature. Volunteer together. 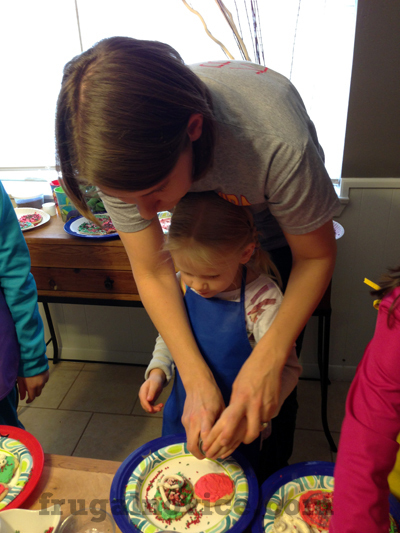 Whether serving a meal at a soup kitchen or lending a hand at an animal shelter, volunteering helps kids learn compassion – and it’s a great way for families to spend time together. Check with your child’s school, your religious institution, a local Boys & Girls Club or The Volunteer Family for project ideas. Encourage routine volunteering. Contributing regularly to an organization they choose can be meaningful, showing kids that they have the power to make a difference. This is especially true for teens. Support them by providing transportation or extra allowance for expenses, if needed. This year, Boys & Girls Club has made it SO easy for you to give with their second annual Give the Gift of a Great Future Holiday Campaign. You can play their Giving Game and donate something to kids that the Club helps. In a matter of a minute or two I was able to play and donate an art kit! It’s a great way to let your kids make a difference and to bring up the subject of giving to integrate it into your children’s lives on a longer-lasting basis. Note: I wrote this review while participating in a blog tour by Mom Central Consulting on behalf of Boys and Girls Club. I received a promotional item to thank me for taking the time to participate. 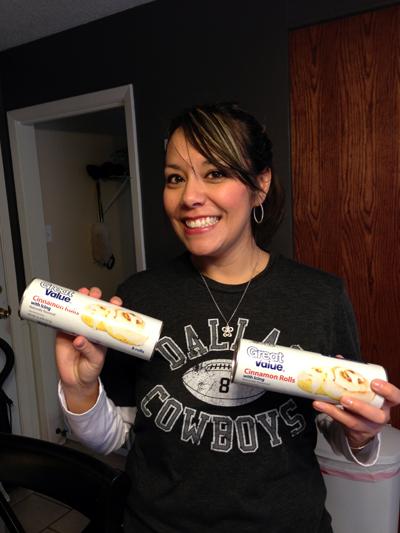 Flavors of the Holidays with Great Value Cinnamon Rolls & Cookie Dough! 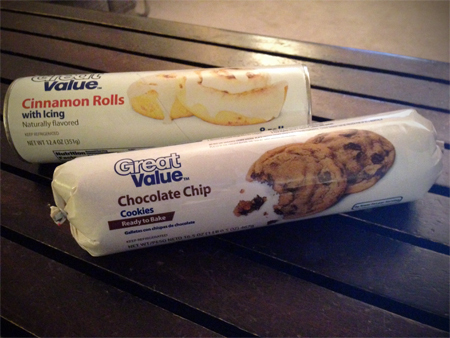 Remember a few weeks ago when I wrote about the fun Great Value baking party I had with some friends? We made apple pie, which was amazingly good. But guess what… I’ve found out a way to kick it up a notch. I’ll share it with you in just a little bit – you’re going to love it! So, as I was saying, we had a lot of fun at our baking party and we decided we definitely need to have one to prep for the holidays. 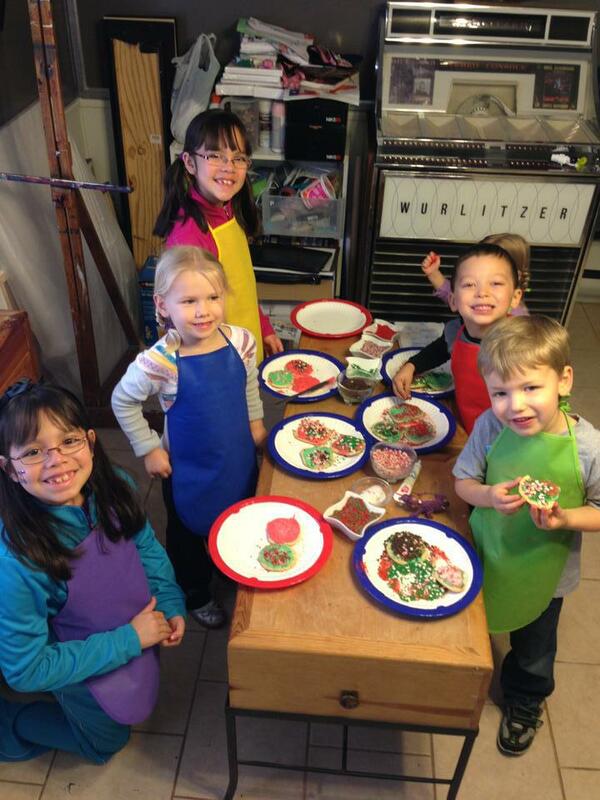 We’re getting together this coming Saturday morning for a cookie baking and decorating party. Since it’ll be morning, I’m going to serve some Great Value cinnamon rolls for breakfast… but why relegate cinnamon rolls only to breakfast? Here’s where my hint above comes into play… you can use cinnamon roll dough for pie crust! Just spread rolls into a thin layer and place in a pie pan, then follow the rest of the recipe as normal. YUM! 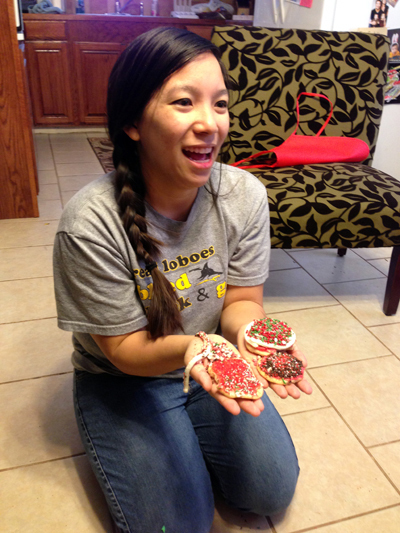 The main focus of our party on Saturday, though, will be cookies. And we’re inviting our kids along this time, so it should be a blast! We’re going to make some sugar cookies – but instead of taking a lot of time making dough from scratch, we’re getting right to the fun part. 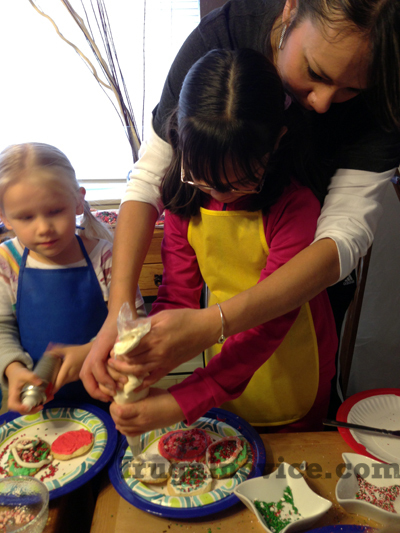 We’ll just use the Great Value cookie dough and roll it out on a floured surface, and let the kids pick their favorite shapes. So easy! 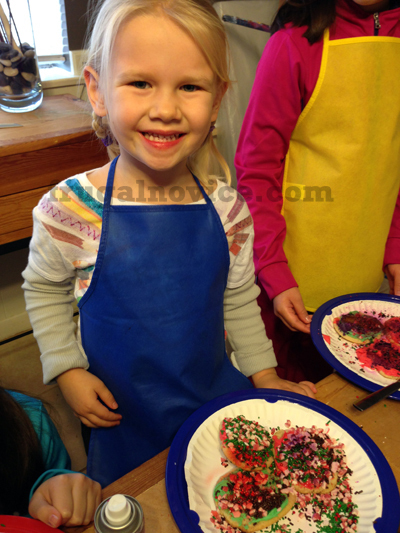 I’m going to make up a bunch of different colors of icing so they can get creative with decorating (and I even got some kid-sized aprons for them to wear)! 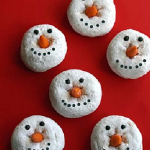 Aside from sugar cookies, we’re going to let the kids make simple snickerdoodles – just roll slices of the sugar cookie dough into balls, then coat in a sugar/cinnamon mix. So good – and so easy! I also bought some chocolate chip cookie dough. But instead of just making chocolate chip cookies (which, let’s be honest, are pretty delicious on their own) we’re going to take it one step further and wrap the cookie dough around chocolate creme sandwich cookies – it’s an easy way to add a little surprise and extra flavor to the cookies. I can’t wait to tell you all about the party, and of course I’ll take a ton of pictures to share with you! Check back this weekend for my follow up post and I’ll even have another recipe to share with you, along with my favorite 5 cookie ideas to inspire you. There’s something almost magical about snow globes. I’ve loved them since childhood, and our kids love them now too. 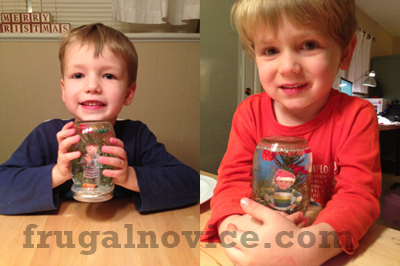 So I, of course, excitedly said yes when my friend Kristi asked if I’d want to make personalized snow globes with her. 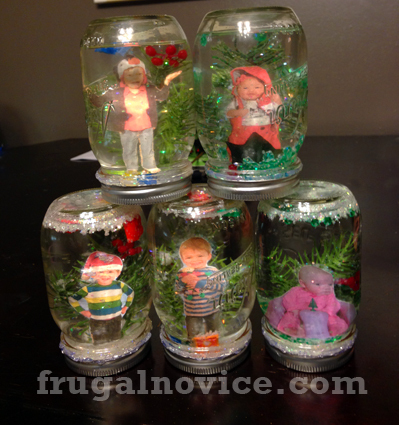 This is a perfect craft to do for kids (or with kids, if yours are a little older) – it’s creative, fun, and inexpensive. Any other additions you’d like – garland/tree branches, beads, etc. the background, and laminate them. When you cut out the laminated image, make sure to leave extra around the photo so it stays sealed and water doesn’t reach your image. 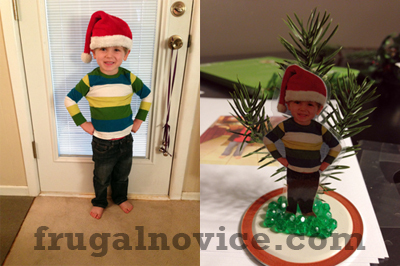 I bought a sprig of garland at the craft store and we pulled pieces off to serve as the background for our photos. Kristi had some small gravel and we also had some green beads to hot glue around the feet to help secure the photo. One note – make sure that you don’t glue anything too close to the edge of the lid – it’ll make it difficult to close the jar securely (and it really doesn’t show up very much at all, so don’t worry about needing to cover the whole thing). Once you’ve finished securing everything to the lid, fill your jar with water and glitter, along with any other little items you’d like. For the girls, we used some more green beads, and for the boys we added some small Lego pieces. Make sure to not fill the jar ALL the way to the top, because you have to account for the items displacing a little of the liquid. 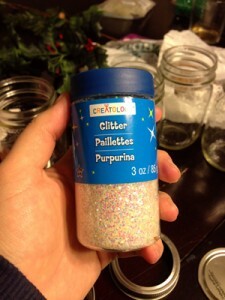 When we were looking for tips, we saw some people suggest using baby oil to slow the glitter down a bit. We tried this, and the glitter initially clumped together like big blobs in a lava lamp. I ended up rinsing all of mine out, and I think it works just fine with only water. 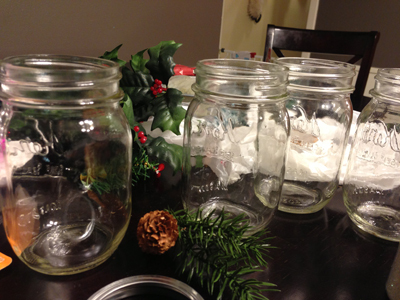 Once you’re happy with how your jars look, use hot glue to secure the lid. We put a bead around the edge, and then on the bottom, too – where the two parts of the lid meet. The bead of glue on the bottom also serves to keep the jars from sliding around as much, which is nice. Here are the finished products – what do you think? 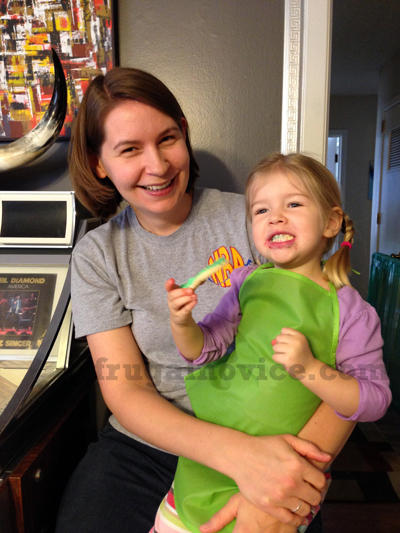 We do a LOT of our shopping on Amazon, for everything from gifts to books to diapers and more. 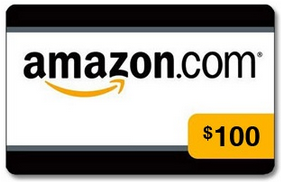 MROstop is hosting a giveaway for a $100 gift card to Amazon, and I’ve had fun brainstorming what I’d get if I won – a couple of books for my Kindle, some toys for the kids, or maybe a couple of gifts I have left to purchase! What would you get if you won? Enter below! Giveaway brought to you by MROstop air springs. Visit the giveaway page here. 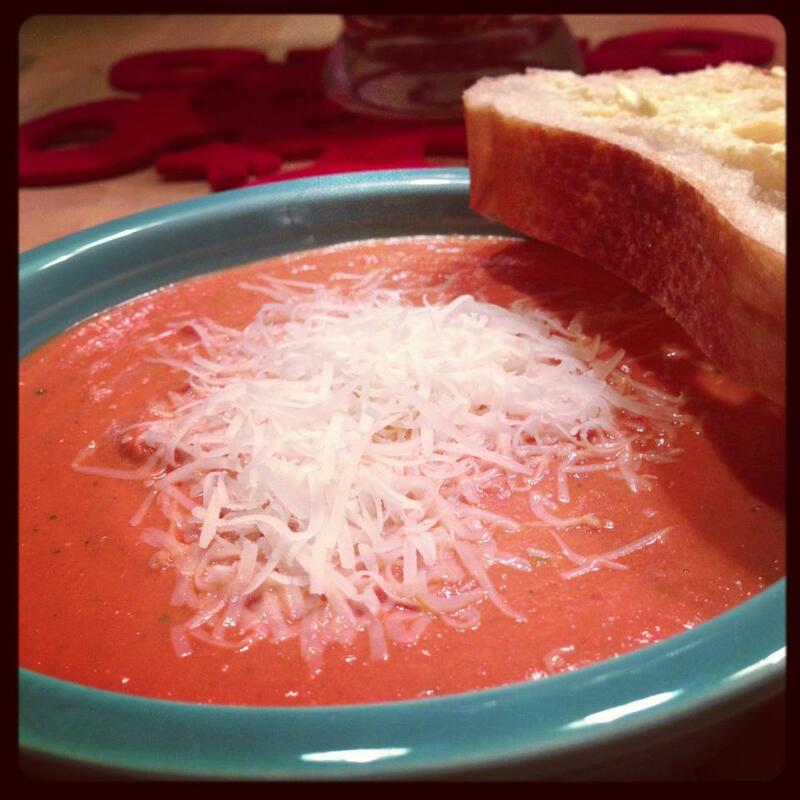 One of my very favorite soups has always been La Madeleine’s tomato basil soup. This recipe is the closest replica of the soup we’ve ever tasted – we discovered it after modifying a tomato sauce recipe a friend introduced us to. We love it, and I hope you’ll enjoy it as much as we do. Add the carrots and onion, and saute until they are translucent (keep stirring them so they don’t get very brown). Add the tomatoes, basil, and salt/pepper and stir. Cover and simmer on low heat at least 20 minutes (but you could let this go all afternoon), stirring occasionally. VERY carefully blend the sauce with an immersion blender until smooth. I used a blender the first time but quickly discovered how much easier it was with an immersion blender – clean up was a cinch! Use whatever you have on hand, though. Either one will get you to the same end result. If you’re using a blender, you might want to let the soup cool a bit first. Enjoy! Serve with freshly-grated Parmesan and a crusty loaf of French bread. Yum! In years past, I have to confess we’ve just scotch-taped Christmas cards to our back door. This year I thought I’d try something a little more purposeful, so I set out to Michael’s in search of an inexpensive, easy Christmas card holder to make. I came across some white boards cut out in various shapes for just $3, and inspiration struck. I painted the board with chalkboard paint we already had on hand from our kitchen border project, but you can buy a small bottle of it at Michael’s (it retails for $6, but you can usually find 40% off coupons to make it cheaper). Then I hot-glued strands of ribbon to the back of the board in alternating red & green colors, and trimmed the bottoms to look nice and neat. I decided to go with “Season’s Greetings” for the message, but what I really love about this project is you can change the wording each year. I think kids would have a lot of fun helping with decorating the board, don’t you? To adhere cards to this holder, I bought some small clothes pins. I thought about embellishing those, but I decided I wanted the cards to really stand out so I left them plain. I’m kind of in love with this simple solution for cards (and the fact that it’ll take up very little space in our Christmas storage once we have to pack it away)! 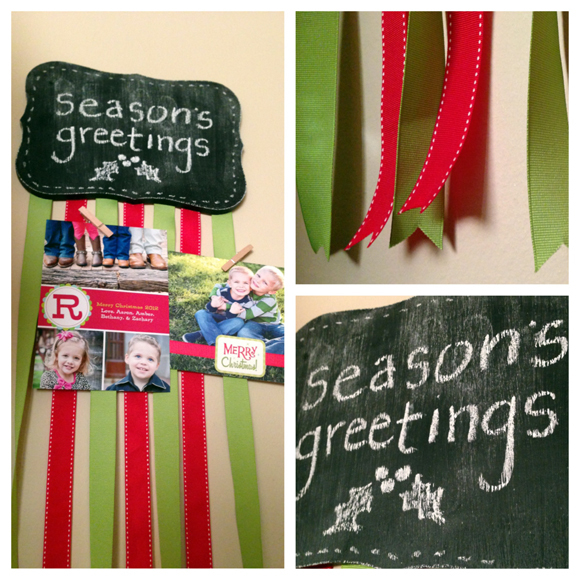 How do you display your Christmas cards? 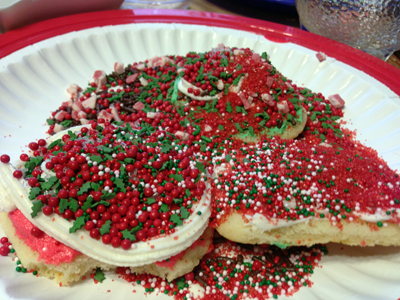 10 Creative & Easy Christmas Desserts!